Ideally, I prefer my moisturiser to contain an SPF but having said this, I'm still hunting for one which I really like and have recently tried brands including Super Facialist by Una Brennan, Good Things and Soap & Glory in my search. I wasn't familiar with the Naked Skin brand but have to admit that the grey tub with minimalist design wouldn't stand out to me on a shop shelf- it's pretty dull. However, on reading the description, I was excited to try Naked Skin Thirst Aid 12 Hour Moisturiser, particularly as the natural credentials appealed to me (it is 97% natural). Although it doesn't have any SPF properties, I liked the fact that it is aimed at sensitive skin and is alcohol free. The cream didn't have a very strong fragrance and although it is described as being fragrance-free, I'd say it had a cotton-like and almost slightly plastic scent to it. Whilst not particularly to my liking, luckily, it wasn't too strong. I didn't like the texture. I know I have dry skin but I found the formula too thick. I only had to lightly dip my finger tip into the tub to have sufficient product to cover my whole face yet prevent it from feeling too sticky. However, as there was only a little product to cover my face using this amount, I felt as though I was dragging my skin quite a bit. I suppose that the tub would last a long time for this reason! Even with such a small amount of product applied, I found that my face remained sticky at the end of a day. Similarly if I applied the cream before bed- my skin still felt sticky and clammy when I woke up. So many hours later and still I didn't feel as though it had been absorbed! Perhaps this fulfils the 12 Hour Moisturiser claims but I didn't like being reminded that I had it on if I touched my face- no matter how little I had used. 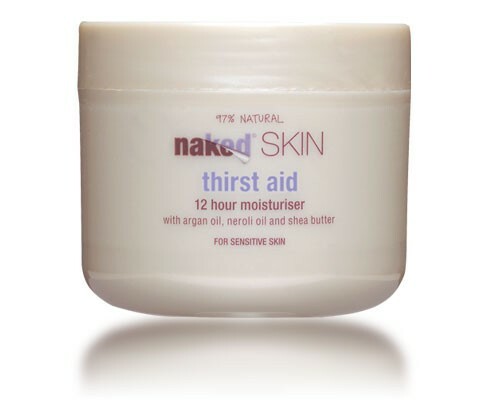 As a result of the thick texture and how it left my skin feeling sticky to the touch following application, I wouldn't recommend Naked Skin Thirst Aid 12 Hour Moisturiser. It definitely moisturises and perhaps it is intended for people with much drier skin than my own, in which case it may work but I suspect anyone with normal-oily skin would find this far too heavy.